Is there a good command-line UNIX charting / graphing / plotting tool out there? I'm looking for something that will plot xy points on an ASCII graph. Just to clarify, I'm looking for something that will output a graph in ASCII (like ascii-art style), so I can use it over an interactive shell session without needing X. Try gnuplot. It has very powerful graphing possibilities. While gnuplot is powerful, it's also really irritating when you just want to pipe in a bunch of points and get a graph. Thankfully, someone created eplot (easy plot), which handles all the nonsense for you. Plots in a single line are really simple, and can help one see patterns of highs and lows. __version__ = "2015-01-02 jan  denis"
""" scale x from_ -> to, default min, max -> 0, 1 """
feedgnuplot is another front end to gnuplot, which handles piping in data. gnuplot is the definitive answer to your question. I am personally also a big fan of the google chart API, which can be accessed from the command line with the help of wget (or curl) to download a png file (and view with xview or something similar). I like this option because I find the charts to be slightly prettier (i.e. better antialiasing). It looks better at 79x24 (don't use the 80th column on an 80x24 display: some curses implementations don't always behave well around the last column). I'm using gnuplot v4, but this should work on slightly older or newer versions. A very heavy and overpowered solution would be to install cernlib and use paw. Another simpler/lighter alternative to gnuplot is ervy, a NodeJS based terminal charts tool. Supported types: scatter (XY points), bar, pie, bullet, donut and gauge. Using this you can run it as eplot -T to get ASCII-graphics result instead of a gnuplot window. 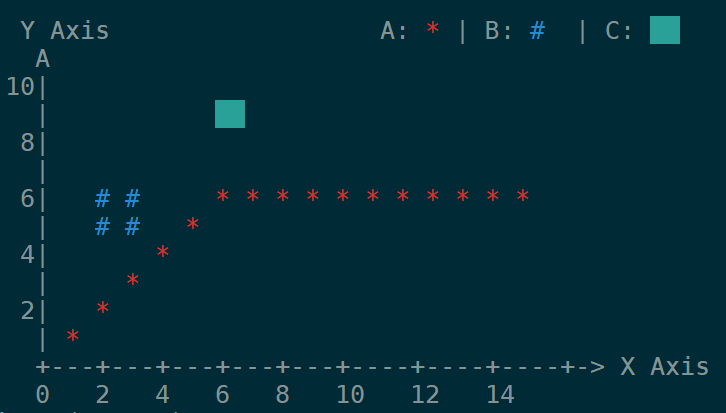 Also, spark is a nice little bar graph in your shell. Not the answer you're looking for? Browse other questions tagged unix charts graph matplotlib or ask your own question. Is there a command line tool for data visualization and analysis? Character-mode (shell) plots with Matlab / Octave? Is there any python module to plot 2d cartesian coordinate in text mode?